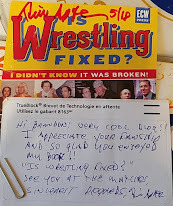 Back on January 19th I went to the Let's Wrestle Rumble in Orono, Maine, you can read all about it here. 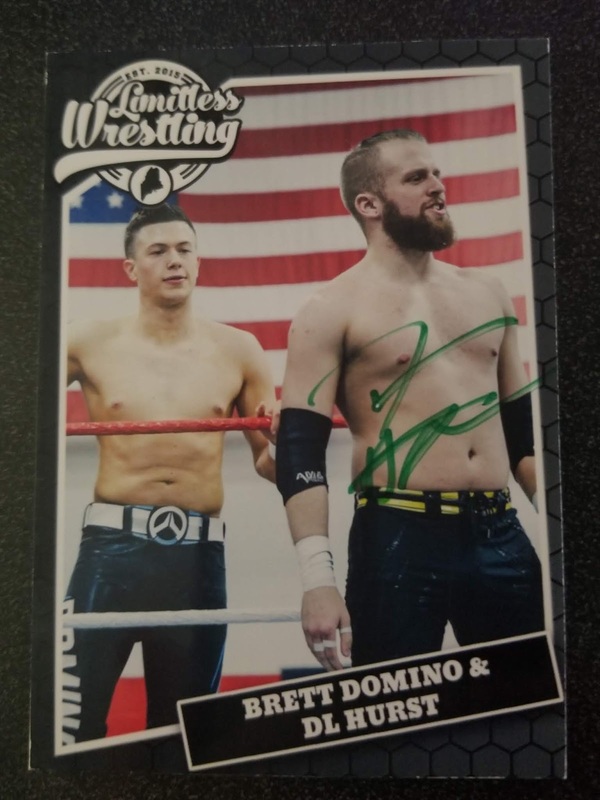 At that show I was able to add three cards to my collection, all three of these were from the Limitless Wrestling set. From Massachusetts he debuted in late 2014 and at some point trained with Biff Busick, now known at Oney Lorcan in NXT. I first saw him in 2015 at Limitless Wrestling and I truly enjoy his technique and intensity in the ring. He took some time off in 2018 but returned to the ring in 2019 at this show. 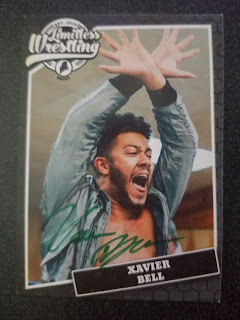 I hope to see him wrestle more in the future. Also a New England native, Davienne debuted in 2013 after training with Brian Fury. 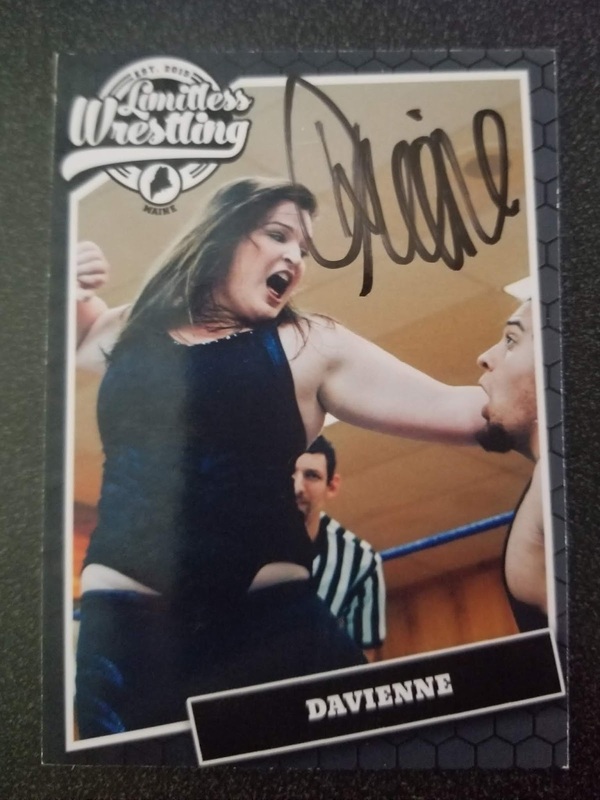 She has wrestled all over New England and recently became the inaugural Let's Wrestling Champion. Trained at the New England Pro Wrestling Academy by Brian Fury he has competed in several New England promotions like Chaotic Wrestling, Limitless Wrestling, and in 2018 was in the Chikara Young Lions Cup. He was eliminated in the first round. A injury has kept him out of action for most of 2018. I look forward to seeing him back in the ring as he's very talented and is definitely a guy you don't want top sleep on if he comes to your area. 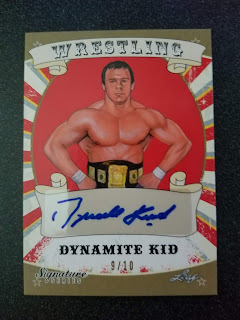 This is a 2016 Leaf Wrestling Signature Series card numbered 9 of 10. I had tried for years to find a way to get a card signed and just never did. After I read of his passing I went right on Ebay to buy it before the prices were jacked up on them. 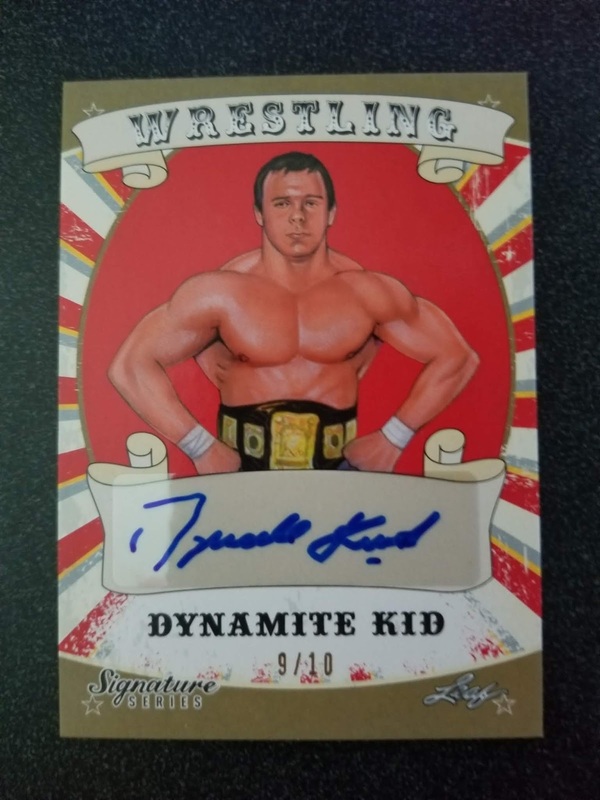 It's the only way I'll ever get a signed Dynamite Kid card, who is one of my all time favorites, and even though I'm glad I have it, it just doesn't mean as much as my other cards. This is why I don't buy signed cards. I know others love to collect these, and that's cool, that's just not me and there's nothing wrong with that.